Reaching 40cm tall and spread, they repeat flower from April well into Autumn, and are fully hardy. Supplied as 3 plants in 9cm pots - 1 each Night Skies, Tropical Sunset & Easrly Sunrise. These superb new Compact two-tone colour changing perennials are just the thing for Summer long colour. 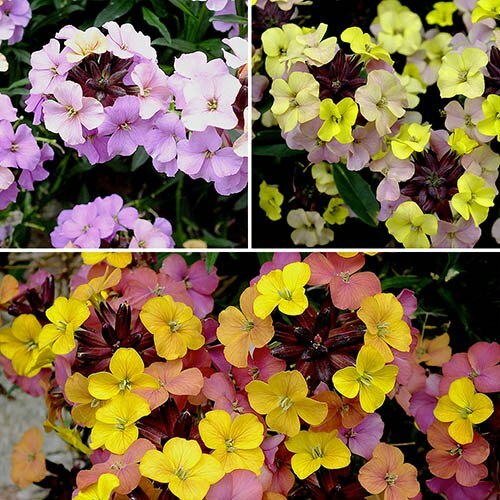 Launched in 2016 and British-bred, they are a fabulous easy-care series of Hardy Wallflowers (Erysimum) and ideally suited for the UK climate. The sweetly fragrant blooms are characterised by their contrasting tones, a mix of shades of yellow, orange, lavender and last for ages. Reaching 40cm tall and spread, they repeat flower from April well into Autumn. Not to be confused with their wallflower cousins these are true hardy perennials and will re-appear in your garden year after year. Supplied as 3 plants in 9cm pots - 1 each Night Skies, Tropical Sunset & Early Sunrise.